"Know From Where You Came and Where You Are Going"
UPPER WEST SIDE — A new exhibit at the JCC Manhattan includes sculptures and paintings centered on the themes of migration and hope by a Jewish American artist who incorporates Israeli soil into his work. Aithan Shapira draws on his family history of migration in "Know From Where You Came And Where You Are Going," on view through Feb. 29 at the JCC's Laurie M. Tisch Gallery on Amsterdam Avenue at West 76th Street. Shapira's mother emigrated from Iraq to Israel, and then she and Shapira's father came to the U.S. before he was born. The artist mines this family history and his own experience traveling back and forth to Israel in abstract paintings and sculptures. With a sculpture that consists of a pile of life preservers cast in concrete and tied together with rope, Shapira meditates on the ideas of migration and hope, said curator Megan Whitman. Life preservers are a symbol of hope, "but there's something very sad about this work as well. [The concrete objects] wouldn't actually save anyone," Whitman noted. In that sense, Shapira is asking viewers to consider "how we attach hope to things that aren't actually helpful," she said. The rope for the preservers features the same tying structure that's used with tefillin, a prayer box that is worn during Jewish morning prayers. Another sculpture uses concrete castings of jars from Shapira's grandmother that she brought with her from Iraq to Israel. The artist also created cement casts of petals of a Sabra plant, a cactus fruit, which is also a symbol because it was brought to Israel from Mexico. "Perhaps the whole idea of the native Israeli plant is that it's a product of migration," Shapira explains in the exhibition text. Cement is a "very pedestrian" material found on sidewalks and all around us in the city, "so to see cement in this fine art frame is very interesting for people," Whitman added. Another surprising element is Shapira's incorporation of soil from Israel's Judean Desert into his paintings, she said. 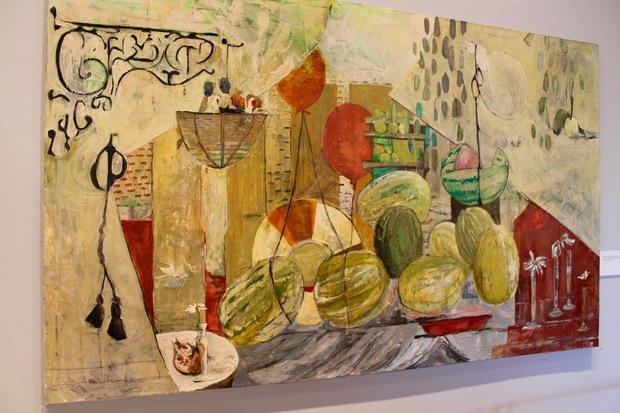 The paintings are abstract still-lifes that use repeated symbols like the life preserver and recall the plants and landscape features of Israel. They show "his desire to connect with a land that's far away by imbibing it with the spirit" of Israel and its land through the soil he mixes into his paints, Whitman explained. Shapira is exhibiting in New York City for the first time with the show, and he chose to collaborate with the JCC because of its strong relationship with the city's Jewish community, she added.